Diet is always a crucial part of weight loss. No matter how hard you exercise yet your diet food is all wrong, you can hardly achieve results. For those who want to stick to the best diet food for weight loss, here are some of the best diet food you should go for. These include spinach, kale, swiss chards, collards, etc. They are low in carbohydrates and calories which makes them great for your weight loss diet. Plus, they’re loaded with lots of fiber. Going for leafy greens is always a good way to increase your meals’ volume without having to increase the calories. Studies show that diets and meals with low energy density tend to make you eat fewer calories all in all. Also, leafy greens are high in antioxidants, vitamins, and minerals, which include calcium that is said to promote fat burning. Processed meat is definitely unhealthy, but research shows that unprocessed red meat doesn’t raise risks of diabetes or heart disease. Consuming unprocessed lean meat is also great to increase your protein intake. It would be easier for you to lose excess fat if you replace some of the fat and carbs in your diet with protein. 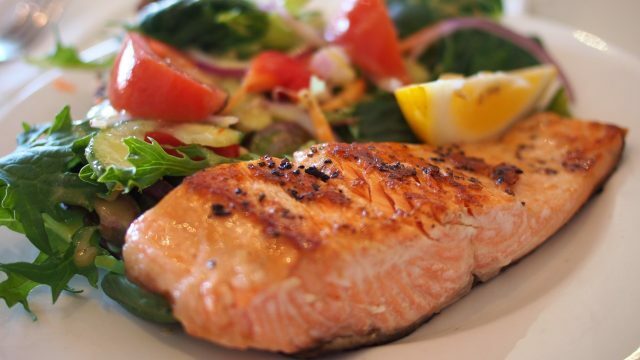 Fatty fish such as salmon are really healthy and also incredibly satisfying. It can help you feel full for long hours with just a few calories. Also, it’s high in healthy fats, protein, as well as other essential nutrients. Seafood overall also offers a good load of iodine. This essential nutrient is crucial for good thyroid function, which is crucial to help your metabolism run optimally. Some of these vegetables include cauliflower, broccoli, Brussel sprouts, and cabbage. Like other vegetables, they are high in fiber. Plus, they are very filling. They also contain a good amount of protein. Some legumes and beans are great for weight loss, including black beans, lentils, kidney beans, etc. These foods are high in fiber and protein—two essential nutrients known to promote satiety. It’s high-protein, low-calorie food. It is lean fish, so it’s basically low in fat. Tuna is very popular among fitness models and bodybuilders and is great for increasing protein intake while also keeping fat and calories low. However, if you want to solely go for protein intake, choose tuna which is canned or packed in water and not oil. Eating chili pepper is said to aid in weight loss. Chili pepper contains capsaicin, a popular substance shown to reduce appetite and boost fat burning. This substance is even available in supplement form and is also a usual active ingredient in various weight loss supplements. Cereals have had a bad name in the past few years, but some types of cereals are actually healthy. Whole grain cereals are definitely not a problem as they’re filled with fiber and have a good amount of protein. These include brown rice, oats, and quinoa. Oats are filled with beta-glucans. These are soluble fibers shown to boost satiety and enhance metabolic health. Choosing soups rather than solid food helps you feel easily satiated and consume considerably fewer calories. However, do not add a lot of fat to it, especially coconut milk and cream, as this can just increase your calorie intake. Generally, dairy products are high in protein. Cottage cheese is one of the best dairy options since it is mainly protein with very minimal carbs and fat. With cottage cheese, you can increase your protein intake while feeling easily satiated and consuming fewer calories. Cottage cheese among all dairy products is also high in calcium which is known to facilitate fat burning. Other high-protein, low-fat dairy products are skyr and Greek yogurt. Nuts have fat content, but they aren’t as fattening as you’d expect. Nuts are actually a great snack option as it contains balanced amounts of fiber, protein, and healthy fats. Some studies have also shown that eating nuts enhance metabolic health and aid weight loss. However, don’t go overboard as this snack is still relatively high in calories. If you love binge eating a lot of it, might as well do away from them. You can never successfully go through any weight loss program without paying attention to your diet. Supplements and exercise won’t make the cut. Proper diet food for weight loss as well as healthy lifestyle changes are always the way to go.